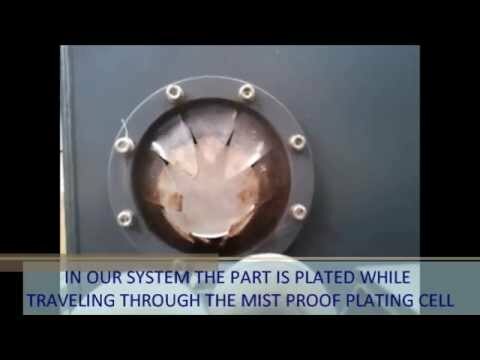 Technology | PLATING INNOVATIONS S.r.l. The Continuous Plating process is an innovative but well tested method for the production of plated bars and tubes for the pistons rod and the linear guide system industries. Unlike the dip plating and rack system method, which are generally adopted and can be described as a batch treatment,in the continuous chrome plating process bars to be plated run longitudinally through a plating device one after the other continuously.This system was born in Italy in the early eighties of the last century. Despite of its very valuable technology the continuous plating is not yet as popular as it should be. However at present several companies worldwide produce thousands of meters of chromium plated rods every day using the continuous plating technology. In 2010, After two years of R&D, PLATING INNOVATIONS has developed its own proprietary Continuous Plating System. We named our system Through Feed Plating®: it is based on the principle of the continuous axial rotation of the bar while moving through the plating cell. This new system works in the same way of the Grinding but, while the grinding removes material from the surface, in our Through Feed Plating® chromium ions adhere on the rod’s surface during its movement into the plating bath.Thanks to the hundreds of turns inside the plating cell, we are able to obtain a perfectly concentric layer. Furthermore this system allows a total evenness of the deposit from end to end. In the course of this linear, completely automatic and absolutely safe movement, the machine carries out every processing step as: loading materials on the production lines, etching, chromium plating, washing, cooling and unloading. Whereas our system wisely combines Experience, Know-How and R&D it can fairly be stated that the Through Feed Plating is bound to become the technology of the future in the Hard Chrome Plating Industry for hydraulics applications.